1 of 2 Heat oven to 325 degrees F. Finely crush graham crackers. Add butter and sugar and mix until all crumbs are moist. Press into bottom and up side of a 9-inch round springform pan. 2 of 2 Bake crust at 325 degrees F for 15 minutes or until lightly browned around edges. Place on wire rack and cool completely. 1 of 6 In a small bowl, stir together apple juice and vanilla. Sprinkle gelatin over top and let stand 5 minutes. 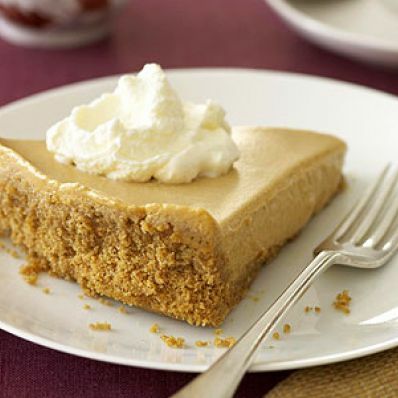 2 of 6 In a medium-size saucepan, whisk together pumpkin puree, evaporated milk, brown sugar, egg yolks, pumpkin pie spice and salt until smooth. Cook over medium heat, whisking, for 9 minutes or until temperature registers 140 degrees on an instant-read thermometer. Continue stirring over low heat for 3 minutes more, maintaining 140 degrees . 3 of 6 Microwave gelatin mixture for 10 seconds, until melted. Whisk into pumpkin mixture and remove from heat. 4 of 6 Pour filling into large bowl. Place in a larger bowl filled with ice water. Stir occasionally for 12 minutes or until cooled. 5 of 6 With electric mixer, whip cream on medium-high speed until stiff peaks form. Gently fold into cooled pumpkin mixture. Pour filling into cooled crust. Cover and refrigerate overnight. 6 of 6 When ready to serve, run a thin knife between pan and pie. Remove side of pan, slice and serve. Per Serving: 152 mg sodium, 2 g fiber, 11 g sat. fat, 119 mg chol., 19 g Fat, total, 39 g carb., 5 g pro., 340 kcal cal.